Sampson’s Prosthetic & Orthotic Laboratory is a COAPT-certified facility. The COAPT COMPLETE CONTROL™ system is an advanced control solution designed to enhance the functionality of a powered myoelectric prosthesis for upper-limb amputees. COMPLETE CONTROL uses a proprietary, clinically practical version of pattern recognition technology in a small electronic circuit board to non-invasively acquire and translate information from muscle signals. This information is used to enhance the control of industry standard upper-extremity prostheses. Bill Sampson, CP, is among the first in the industry to recognize the benefit of pattern recognition, utilizing the COMPLETE CONTROL system with Sampson’s upper-limb amputees. COMPLETE CONTROL learns patients’ pattern of muscle signals at their command, putting the patient in control. When the muscles signal hand open or hand close, that is what the prosthesis will do. 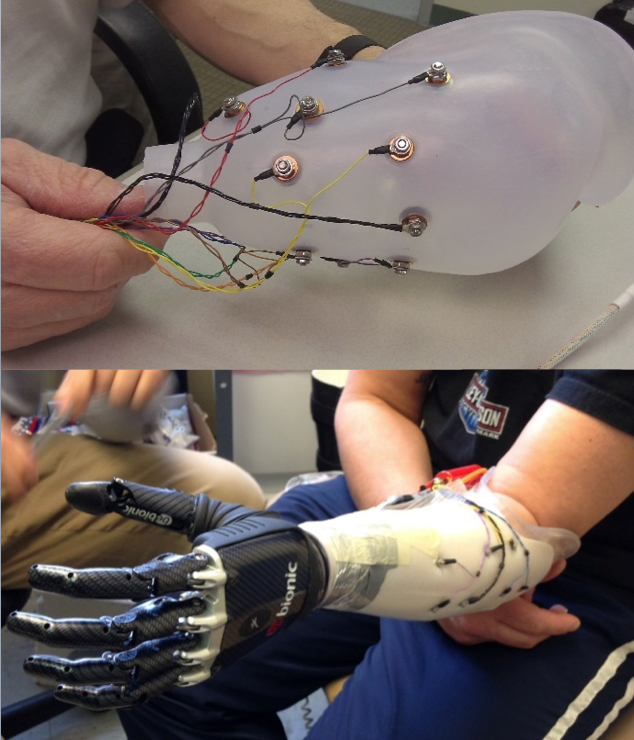 In contrast, standard myoelectric control only considers the signal level from one electrode, and patients are often required to make non-intuitive contractions to command prosthesis actions – such as using wrist extension and flexion contractions to command a prosthetic hand to open and close. Also with standard myoelectric control, muscle control sites are limited because of the need for signal isolation; patients have to use “switches” to cycle between prosthesis functions. With pattern recognition, patients can directly control each of their prosthesis’ motions without cumbersome and non-intuitive switching. Pattern recognition has the advantage of being able to utilize low intensity muscle contractions as needed. This is beneficial for standard myoelectric control patients who were required to elicit strong control contractions that tire them too quickly. With pattern recognition, the system can take full advantage of the patient’s ability and relates a wide range of the muscle contraction intensities to prosthesis speeds. Changes in socket fit, skin condition, fatigue, mental state, battery health and many other factors can diminish the patient’s function with their prosthesis, resulting in a visit to the prosthetist for adjustments and software resetting. With pattern recognition, the control can adapt to changing conditions by means of re-calibration that the patient can do quickly and efficiently as needed. In summary, the benefits to patients are physiologically intuitive control; no mode switching; superior proportional control; lighter control contractions; and on-the-go recalibration.